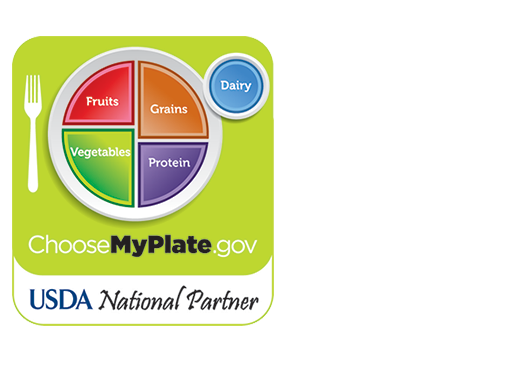 Choosing a variety of foods from each food group to create nutritious meals and snacks is part of Living Well. Fruits: Focus on whole fruits. Whole fruits include fresh, frozen, dried, and canned options. Choose whole fruits more often than 100% fruit juice. Vegetables: Vary your veggies. Vegetables are divided into five subgroups and include dark-green vegetables, red and orange vegetables, legumes (beans and peas), starchy vegetables, and other vegetables. Choose vegetables from all subgroups. All veggies count - fresh, canned, frozen, and 100% juice! Make it a goal to fill half of your plates with veggies or veggies and fruit. Learn more at fruits & veggies more matters. Grains: Make half your grains whole grains. Grains include whole grains and refined, enriched grains. Choose whole grains more often as well as those with 9 or less grams of sugar per serving. Protein Foods: Vary your protein routine. Protein foods include both animal (seafood, meat, poultry, and eggs) and plant sources (nuts, beans and peas*, seeds, and soy products). Choose a variety of lean protein foods from both plant and animal sources. *Note: Beans and peas are also part of the Vegetable Group. Dairy: Enjoy three servings of dairy foods each day. Dairy includes milk, yogurt, cheese, and calcium-fortified soy beverages (soymilk). If you prefer higher fat milk, yogurt, and cheese, be sure to limit saturated fat from meats and condiments such as butter. Water: Avoid sugar sweetened beverages. Remember to drink water between meals and snacks. Water hydrates the body which allows the body to work better and for us to feel our best! If you have a specific nutrition question, please email us! This nutritional information is not intended to be a substitute for individual advice, diagnosis, or treatment. Always seek the advice of your physician or other qualified health provider with any questions you may have regarding your nutrition needs and/or medical condition. Learn about building a healthy eating style! Learn how you can eat more fruits and veggies!